The angel said: “Fear not, Mary, for thou shalt bring forth a son, and thou shalt give Him the name Jesus ….” And Mary gave birth to her first son, wrapped him in swaddling clothes and laid him in a manger. An angel of the Lord appeared and said: “Fear not, because today the Saviour was born. Ye shall find the child wrapped in swaddling clothes and lying in a manger.” You might remember this Holy Text from your childhood. The creation of cribs in Val Gardena in South Tyrol has been a tradition for centuries. Already in the 17th century farmers in the valley began to carve during the quiet winter months. At first, they mainly made everyday objects such as plates. 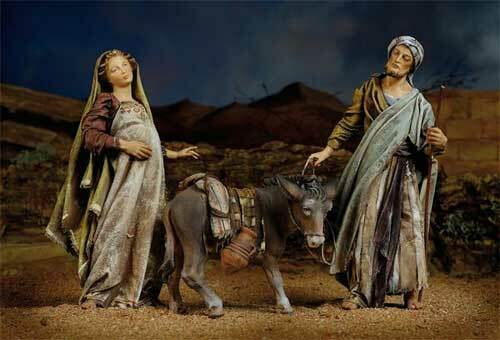 Over the years, the woodcarvers started creating nativity stables, nativity landscapes as well as entire sets of crib figures. Comploj Albert in Ortisei offers a large selection of well-known crib figure sets manufactured by the carvers of the Lepi, Anri and Bernardi workshops in Val Gardena. In our spacious shop you can see our sets of cribs or assemble your own according to your wishes and add matching crib figures and animals, too.